An illustrated tutorial of prehistoric to contemporary world art, from cave paintings to video art installations to digital and Internet media in an easy-to-understand format. This heavily illustrated crash course in art history is revised and updated from the second edition published in 2007, including a new chapter about recent artists and movements. 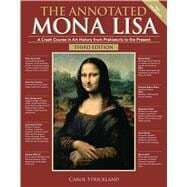 Featuring succinct page-length essays, instructive sidebars, and more than 300 photographs, The Annotated Mona Lisa: A Crash Course in Art History from Prehistoric to the Present takes art education out of the realm of dreary textbooks, demystifies jargon and theory, and makes the history of art movements accessible to beginning art museum-goers – even at a cursory reading. From Stonehenge to the Guggenheim and from African art to Warhol, more than 25,000 years of art is distilled into five sections (prehistoric and medieval, renaissance and baroque, the nineteenth century, modern art, and contemporary art) covering a little more than 230 pages. Carol Strickland has a doctorate in American culture from the University of Michigan. She is the Christian Science Monitor's art critic and contributes feature stories on the arts to the New York Times, Wall Street Journal, Washington Post, and Art and Antiques. She is the author of The Annotated Arch: A Crash Course in the History of Architecture, The Illustrated Timeline of Art History, and numerous artists' monographs. Carol lives in New York City and Long Island.